LG KU-580, it features Google Search, Google Mail and Google Map. 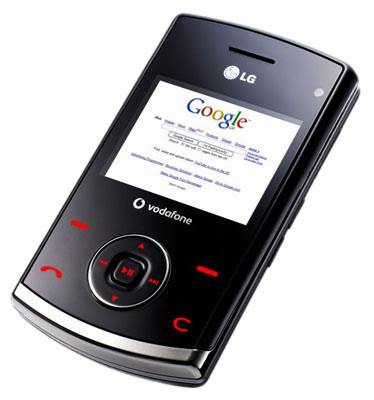 The phone was created as a collaboration between LG and Google. It features LG Chocolate black n red style, along with 2 inch widescreen display, 3G, FM Radio, Mp3 player and more. The Google phone is now available in France and Italy. German and other European countries should have it soon. Base on what I can tell from the pictures, Vodafone will be the carrier.